Over the last ten years we have seen an increasing number of “look good” beauty salons dedicated to “express treatments”. This trend has been driven by a number of factors – primarily the increase in new Express Salon services that are quick and easy to deliver, particularly in a noisy setting such as the High St or a shopping centre. 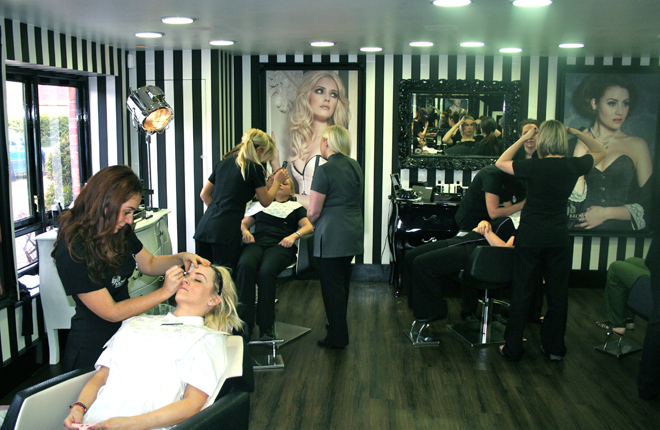 Another factor is the explosion of reality TV shows such as The Only Way is Essex and Made in Chelsea that bring the latest “look good” beauty services rapidly to the attention of consumers. And of course, there is the internet. There was always treatments that lent themselves to an Express Salon service such as nails and waxing and as a result some successful businesses dedicated to those services. But salons that wanted to provide a wider range of services would often run into problems because the very nature of the setting for a “feel good” service such as a facial or a massage needs a calm environment such as chilled out music. On the other hand “look good” services can be done somewhere noisy with loud music. And so they don’t really go together. These are amazing add-ons to pedicures. They retail for approximately €15/£15 and cut down on technicians having to remove hard skin. The service gets delivered in the pedicure chair before the traditional pedicure. This is a technique to boost and lift the lash without having to resort to eyelash extensions. It is €50/£45 per treatment and lasts 6-8 weeks so also provides good repeat revenue. Todays look good girls all want to have fuller/bigger eyes and this has led to a massive uptake of people looking for eyelash extensions. The great thing about this is there is constant repeat business (every 4-6 weeks). There are different price levels depending on whether its natural or artificial hair. Prices can vary from £80-£300 per treatment and will take an hour or more. The application time for CND Shellac is only 30 minutes. The dry time is zero and lasts for more than 14 days with durable shine that resists chips, smudges and scratches. The removal time is brief and the treatment does not damage the natural nail. Prices vary from €25/£20. The more of these Express Salon services there are – the more successful a look good salon can be so we are likely to see many more of these in the future. The question to ask yourself is whether you are a “Look Good” or “Feel Good” salon and to plan your service offering accordingly. The more focused you are on the type of salon you are, the more your customers will get a consistent experience and not a contradictory one. Then your sales will grow. The Phorest TreatCard will also help drive the take-up of different services by introducing your regular clients to new services thus increasing the average spend in your salon.